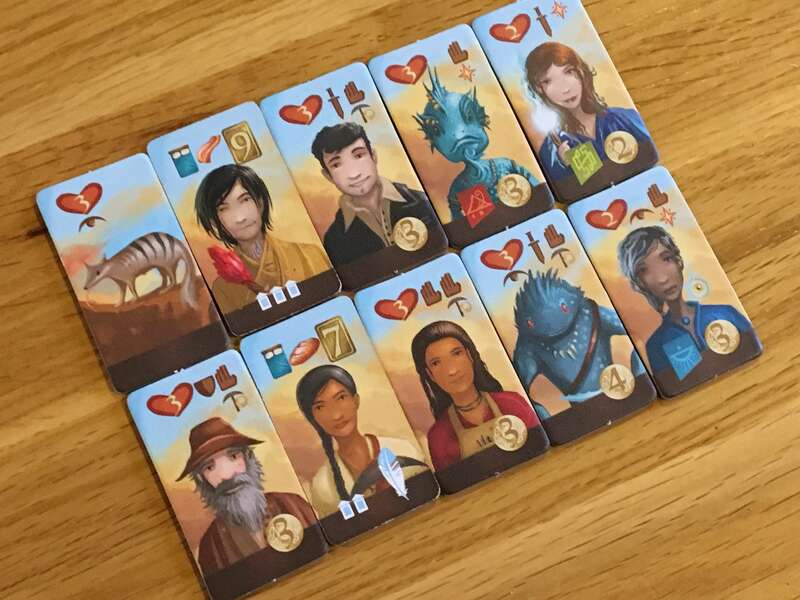 Near and Far: Amber Mines is the first expansion for Ryan Laukat and Red Raven Games’ exceptional Near and Far, which you may remember we both reviewed and included in our Year in Review: Light to Mid-Weight Games last year. Amber Mines is a compendium of small expansions, really, and includes ten modules which can be added or removed in (almost) any way you see fit. We’ve played them all in a number of different combinations, so here’s our detailed review. There isn’t an awful lot to say about the replacement threat cards, really. The new cards obviously look consistent with the original deck and feature enemies of a similar power level (although the range is a bit broader). The stated intent in the manual is for this deck to replace the original one, but I suppose it’s also fine if you want to mix and match (for a harder or easier game) or simply merge both decks together. I bet the design team decided to include this deck following a lot of feedback and fine-tuning, so perhaps players who enjoy Near and Far very, very regularly will notice the subtleties more than I did. The addition of the titular Amber Mines is a more comprehensive inclusion. It effectively replaces the traditional mining action with a much more interesting and varied experience. Instead of simply placing a tent on a space in the mine and taking the benefit, you can now explore the mines by building the board out using a deck of cards. It’s possible to place camps (with tents) in the mine that allow exploration to continue from that point and in general, there are some lucrative benefits and opportunities to score journey points. As you can probably imagine, there are some dangerous cards in there too, so there’s an element of risk and reward. 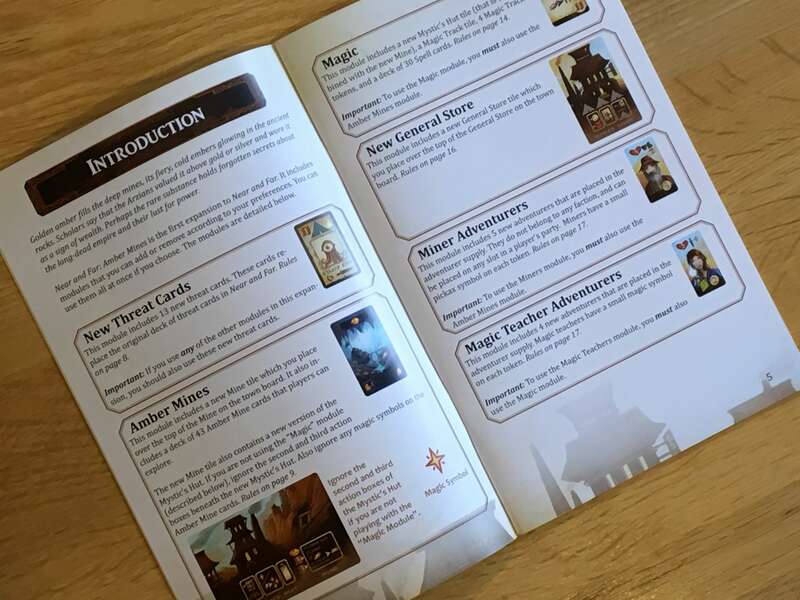 The Amber Mines module comes with two fairly interesting additional decks of treasure and artefact cards that relate to the spoils found within. Again, no complaints here except that perhaps these specialised decks could have been used to do more varied and wacky things. Although they are not aligned to a specific faction in their own right, The Amber Mines expansion adds five new adventurers who are broadly considered to be specialists in mining. They can be recruited from the Saloon as normal and count as any other adventurer in terms of the base statistics they add to the party, but they also grant you an additional coin whenever you place a tent on a mine space that already shows a coin. You can either use the miners =with the base game alone (in which case the benefit they bring is arguably stronger, since it’s easy to accelerate coin collection) or in conjunction with The Amber Mines, which really allows a more specialised mining strategy. The addition of magic spells to Near and Far represents one of the more major additions to the game. The magic module effectively replaces the original Mystic’s Hut with a new board (which also replaced the mine, for The Amber Mines module). With this module, the Mystic’s Hut gains the ability to let players swap the magic they have accumulated for spells. For every three spaces up the magic track a player moves, they’ll gain access to one spell, up to a maximum of three. Spells include additional skills, combat strength or rerolls, for example. More importantly, each spell is worth at least one journey point and the player who advances furthest gains two further journey points at the end of the game. Where magic users are concerned, the game simply adds four new adventurers (who, like the miners, are recruited from the Saloon). Each of these will allow the player to advance your magic track one space, so unlike the miners, they are only used in conjunction with the magic spells module, since it’s the only feature of the game to support magic use. The new General Store simply replaces the original one by overlaying a card on top of it. In my opinion this is a fairly simple, but quite essential, tweak to the original store. If you cast your mind back to how the original board was laid out, there were only two options — gain a coin or take four artefact cards. In the new store, these options are tweaked to include three options, as follows: gain a coin and two hearts; take four artefact cards and keep any of them; or place a tent (up to three) if you’ve purchased certain artefacts. Overall, this is a very minor addition, but in my opinion is a ‘strictly better’ version of the original store and it helps a lot when used in conjunction with The Amber Mine module. The new dice are a possible replacement for the standard dice used in the base game and can be collected by visiting the store. A bit like the new General Store, I feel as though the inclusion of these dice is to correct something based on feedback throughout the life of the game so far, though unlike the new store, I don’t think the new dice are better in all situations. Rather, the new dice add two reroll outcomes, one of which is effectively a ‘no-strings-attached’ reroll upon failure, whilst the other is a ‘reroll if you can spend a unit of food’ version. Effectively there is now a higher chance that players will be able to roll and reroll until they succeed at passing whatever test they are performing. The dice make the game quite a bit easier, so I see this as an entirely optional module to help scale the game. The cooperative mode simply formalises something I had played often as a house rule anyway, but it does so with an extra impetus that I had never thought to include. Duelling (which I have never liked in Near and Far) is removed and players are free to trade certain items and resources between themselves. The tradeoff is that in cooperative mode, the players face off against a (roughly) twenty-five-turn countdown, after which, if no one has placed their last tent, The Red King wins and all players lose. I like this mode because I’ve always felt that Near and Far was a fairly gentle game that suits a cooperative style of play anyway — if I have any feedback on this mode at all, it’s simply that I might like to see more features included for it. Now, there’s a fair bit of ‘other stuff’ in the box when it comes to The Amber Mines, but all of it is relatively minor. There’s a new Numbat animal companion, a load of new talents (see the images I’ve included) a scorepad and a rulebook that explains everything (in a similar way to how I have here). There are a couple of new scenarios to consider in the book as well and, as you’d imagine, everything is well written and easy to digest. In general, there are several kinds of expansion packs made available for board games like Near and Far. 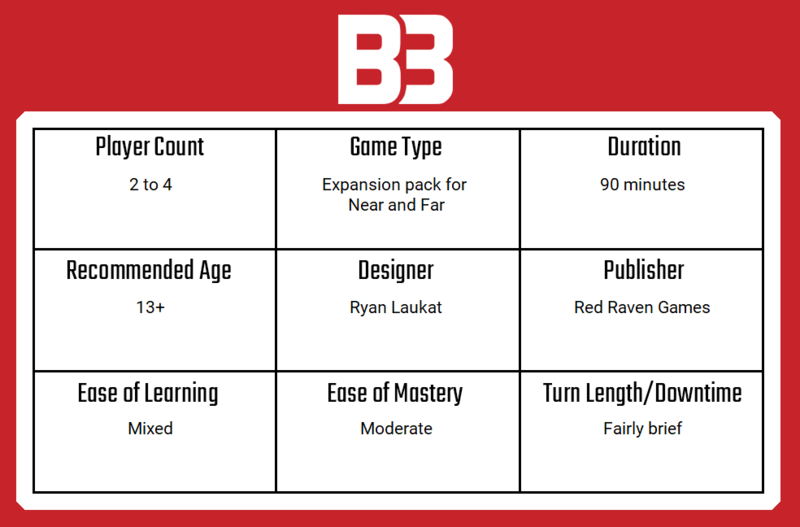 They tend to be either expert-level expansions that layer in additional, complex rules and expect a good existing knowledge of the game; and there are expansions that add and build upon the existing experience in more subtle ways. Usually, if I consider a game like Lords of Waterdeep (which has two expansions) the additions are relatively small and you usually only get one or two of them in the box. 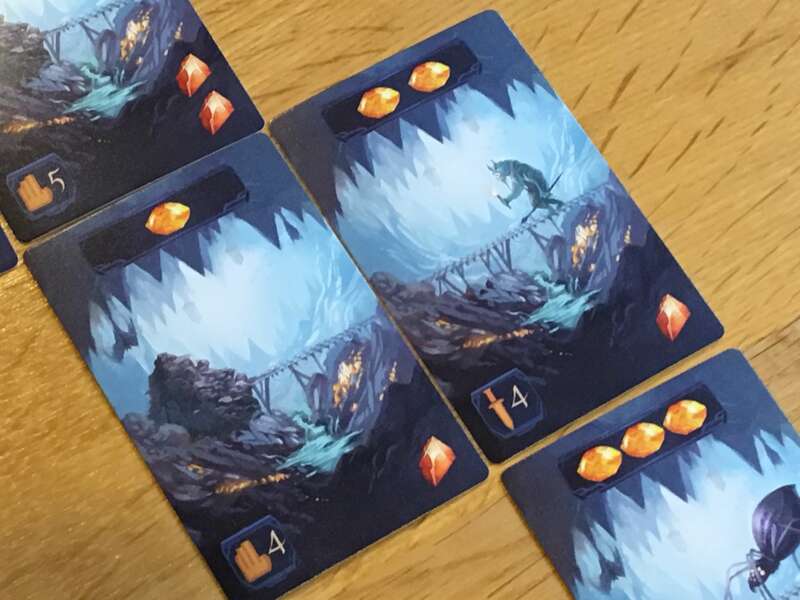 The Amber Mines expansion for Near and Far is undoubtedly the latter kind of expansion, but instead of simply adding a single module that iterates the basic formula, it adds two or three (The Amber Mines, the magic users and arguably the cooperative mode) new features. It also lets you tweak and hone other areas of the game in several ways. With most of The Amber Mines modules active, a new player will still be able to pick up the game and enjoy it, whilst an experienced group will be able to tweak and manipulate the game to suit some more bespoke situations. This isn’t the kind of expansion that new players should automatically add to their basket when buying the base game, but it is an expansion that fans of the game will gain a lot from, especially if wanting to get a lot of extra mileage from the base game. 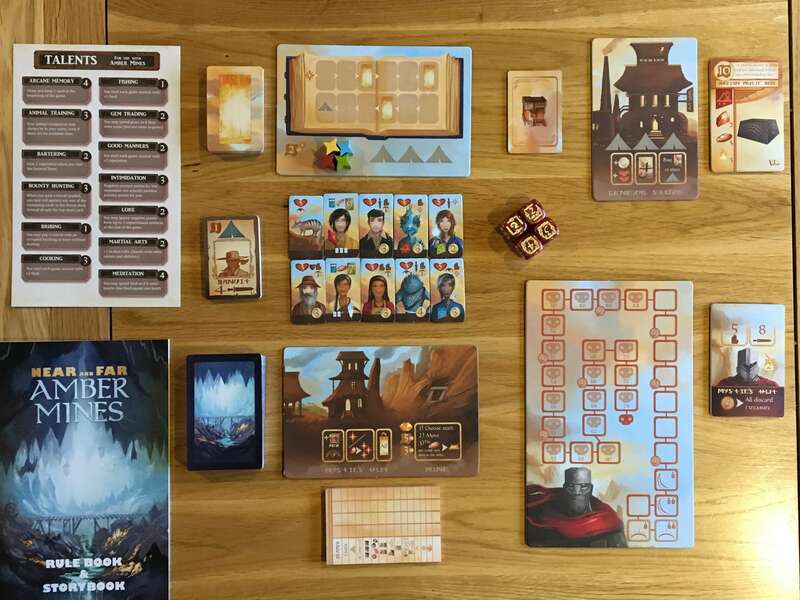 A copy of Near and Far: The Amber Mines was provided for review purposes. You can find out more about it on the website of publisher Red Raven Games.